Can you find the hidden elephant in this picture? Poppy and Lime combined vintage fabrics with funky prints, hand stitching and impressive amounts of fill stitching to form this colourful creature. 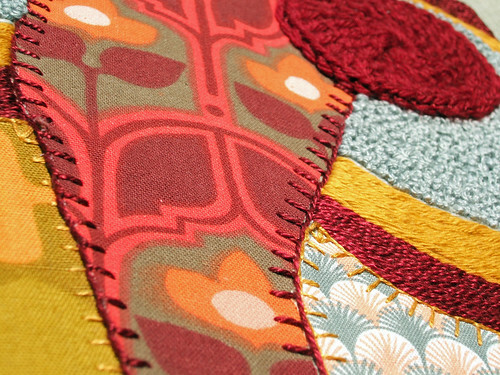 The fill stitching is done by using the Stem Stitch and lots of French Knots. If you haven't mastered Le French Knot yet, head over to this tutorial by Jenny Hart, there is even one for left handed embroiderers! Remember last weeks post about the Lazy Daisy Stitch? It inspired me to make this Lazy Daisy Peacock Feather Stitch. Which is actually a confusing name because it isn't a Feather Stitch at all, just a stitch variation to create a Peacock Feather! I can't believe how amazing all those french knots look! Impressive! I just found your blog, I'm a stitcher and I'm excited about all the inspiration you're going to provide me! The french knot tutorial does look 'fool proof'. Love the Lazy Daisy Peacock Feather Stitch! Did somebody say stitched whales? Stitching in Public Day Giveaway!